A Microfiber Cleaning Mitt for Children. Making it safe, easy and fun for kids to help out with the cleaning. 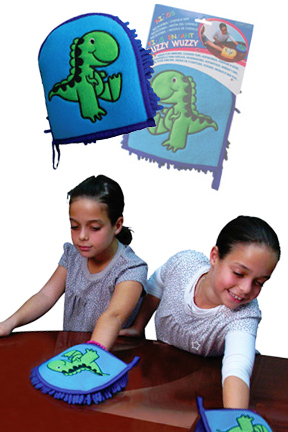 This microfiber mitt is fun for kids to use and effective enough to actually make a difference. Children are able to wash windows, wipe tables and counters, do the dusting, help wash the car and more. This high quality cleaning tool is just as effective as grown-up versions, but just more appealing to a child's eye. The vibrant blue color, and friendly dinosaur character will help them get excited about cleaning. It can be used wet or dry, and really allows kids to lend a hand with the cleaning around the house. Have them help you with everyday chores, or get them prepared to clean up after themselves. The Fuzzy Wuzzy Kids Mitt is perfect for wiping up spills and sweeping up crumbs. Get it damp, and now your kids can clean their own fingerprints off sliding glass doors or windows. Even small children will be able to achieve a streak free shine with little effort and absolutely no chemicals. They will be left with a feeling of satisfaction due to their contribution, and your job will be made easier because they are actually helping. Children enjoy helping out mom and dad with almost everything, and cleaning is no different. This easy to use tool makes it possible for any child to lend a hand. They can use it to play house, help out with chores, or just to clean up their own messes. However it is used though, this high quality mitt will stand up to rigorous abuse and can be washed and used over and over again. Kids will have fun as they learn responsibility and consequences. Cleaning is an important life skill and this fun little tool makes it easy to teach to any child. Use it for dusting, polishing, buffing, cleaning and more. It slips right on any size hand and can be machine washed hundreds of times for when it gets dirty. Comes in blue with a green dinosaur. Order Yours Today! Uses Wet or Dry - dusting, cleaning, polishing, etc. Fuzzy Wuzzy Kids Mitt - A safe and effective tool that allows children to help out with the cleaning. Kids can easily lend a hand or be prepared to clean up after themselves. This great cleaning tool is so fun and effective, kids won't even realize they are helping. Order Yours Today! A Double Sided, Microsham Cleaning Cloth for Windows, Mirrors & more. Top Quality Cloth For Cleaning And Adding Shine To Glass, Metal, Wood & More. Ultra plush, synthetic lamb's wool detailing mitten. Wash, dry, wax, dust and more. A 62" High Parking Helper For Your Garage. For Trucks, Vans & SUV's. Save Water. Improve Control. Achieve The Perfect Stream. Double Sided Lint And Fur Removal Tool. Use On Clothing, Furniture, Upholstery And More! Clean more in less time! A washable and reusable lint and hair roller, complete with storage cover.